"The war was like a great puzzle, great to think about, great to plan, great to do. It was so incredibly peaceful out there in the jungle." As an adviser to a Montagnard strike force, Morris and his guerrillas outfought and outmaneuvered the Viet Cong in his sector. 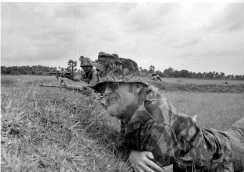 To a Green Beret like Jim Morris, the “Yards” were brothers—so fiercely insular, they would serve no outsider and made the Berets who fought with them honorary members of the tribe…so valiant, they would follow the right man into a firestorm…But while he loved the ambushes, the firefights and the Montagnards, he could see a tragedy unfolding in Vietnam. "As I jumped I heard a crack and felt a thud in my right shoulder. I squeezed the trigger on my M-16. The bolt went ka-schlugg and that was that, baby. Jammed again." "The war was my life and I identified with it totally. To end it was to end me, and that I would not do..."